2007 was the first year the eMetrics Summit came to San Francisco after five years in Santa Barbara. It was also the first year that Eric Siegel put on his Predictive Analytics Workshop along with the eMetrics Summit. That workshop became so popular, it spawned Predictive Analytics World which generated Text Analytics World, and Predictive Analytics World for Government. 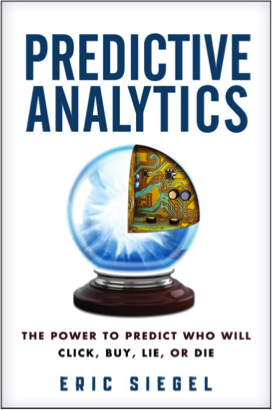 It also prompted Eric (with a little help from yours truly) to write a book: Predictive Analytics: The Power to Predict Who Will Click, Buy, Lie, or Die. 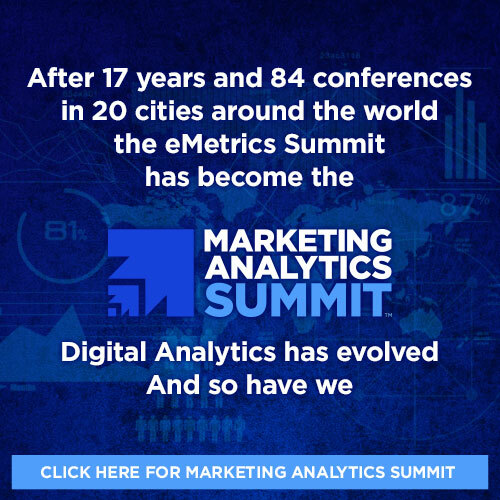 Given that the Predictive Analytics World conference is often co-located – and concurrent – with my eMetrics Summit, I am slightly hesitant to whole-heartedly recommend it – unless you get a combo-pass to both! But I have no hesitation whatsoever with recommending the book. I not only know and like Eric – I actually read the whole book. In these days of skimming short blog posts on a phone, reading en entire, non-fiction book is not something I do often. This one was worth it. Really. It’s informative without being overly mathematical. It’s humorous without trying to be hilarious. And it is chock full of examples from a wide variety of industries and disciplines. I care about marketing and Eric writes a good deal about it. But even if your focus is health care, insurance, fraud detection, crime fighting, etc., etc., buy this book. Since I read a pre-release copy, I’ve been wondering a few things. So I emailed Eric to ask him. He, as always, was generous in his replies. What seems to surprise people the most when you talk to them about the power of Predictive Analytics? People are often surprised by just how big and active predictive analytics already is – the sheer number ofcompanies in full commercial deployment and the wide, cross-industry applicability of predictive analytics, across business, government, law-enforcement, healthcare, and scientific applications. To illustrate this, I included a compendium of 147 mini-case studies in the central color insert of my book. Predictive analytics is real, pervasive and churning out value. What practical application has surprised you the most? Death prediction. Beyond business applications in marketing and risk – some of which are themselves new and unexpected – one of the reasons organizations predict when you will die was personally most surprising to me: One top-five U.S. health insurance company predicts the likelihood an elderly insurance policy holder will pass away within 18 months in order to trigger end-of-life counseling (e.g., regarding living wills and palliative care). Have you asked them for your own expiration date yet? What’s coming up / over the horizon? What should we be on the look-out for? Once your smartphone is more seamlessly integrated with your car, the number of consumer applications of predictive analytics suddenly multiplies and becomes much more apparent to us as end-users, including car theft deterrence, music recommendations, traffic-prediction navigation, guided social media usage (voice activated), driver inattention detection, collision avoidance, and your car’s prediction of its own breakdown so you can take the next exit to get it fixed. This technology can take us so far but no farther. What’s the hard/stop barrier? Limits? People are unpredictable. Better data helps prediction more than better math and models do, but we’ll never predict with high accuracy. Fortunately, we don’t need to. The massive operations of organizations benefit greatly by playing the odds better, tipping the numbers games they already play in our favor. Simply predicting a nice amount better than guessing does the trick! I personally predict that you will get a lot out of Eric Siegel’s Predictive Analytics: The Power to Predict Who Will Click, Buy, Lie, or Die and you’ll enjoy reading it too.